Welcome to the Masthead Restaurant and one of Vancouver Islands most enjoyable dining experiences. 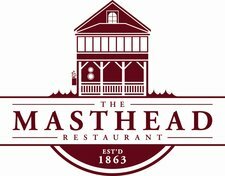 Set in a building built in 1863 as the Columbia Hotel, we at The Masthead Restaurant will delight you in a casually elegant setting with the finest fresh cuisine. Our emphasis is on providing you with amazing food and drink at a great price. We are happy to recommend some personal favorites or an ideal wine pairing from our extensive wine list.